And we’re off! The cars are on the road and we’re en route to South Africa. 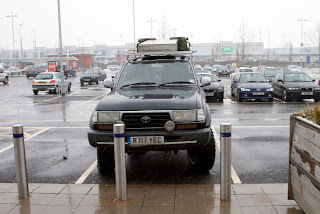 While leaving London, we noticed lots of people peering into our beloved Land Cruisers. We received some perplexed examination, some mouths agape in awe, but our favorite reactions were the thumbs up, honks, and smiles. Fellow motorists on the freeway pulled alongside us and lent friendly waves and encouragement. 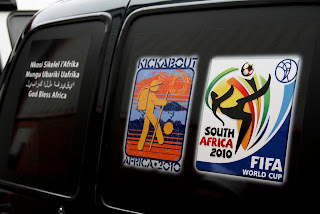 World Cup anticipation is definitely building and we are happy to contribute a little enthusiasm to the commute of those with whom we share the road. If you see us in an area near you, say hello and we’ll salute you back. As you’ll note, our vehicles are adorned in decals. 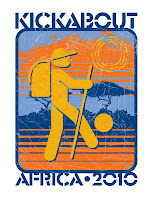 People take interest in reading our multilingual blessings for Africa, the Kickabout logo with the acacia tree and looming sun, and, not to mention, the impressed looks we get once they realize the course we’re taking to get to the World Cup. 0 comments: on "United Excitement in the UK"